Put the dried husks in a large bowl or pot, cover with hot water and submerge for one hour. Roast the poblanos over an open burner flame until charred and rotate throughout process so that all sides get charred. Once charred, place the peppers in a bowl, cover with plastic wrap and allow to steam in the bowl for about ten minutes. Remove the peppers from the bowl, peel off the skin, remove the stems and seeds and cut the peppers into 1/4-inch thick strips. Reserve for later. In a large heavy bottom pan, add enough canola oil to cover the surface with a thin layer. Heat the oil over medium-high heat until it is shimmering but not yet smoking. Remove the mixture from the pan, season with salt and reserve for later use. Repeat the same process for the cremini mushrooms using 1/4 of the onion, garlic and serrano peppers. Once oil is shimmering, add remaining onions, garlic and serrano peppers and cook for 5 minutes or until translucent. Stir in the poblano pepper strips and the mushroom mixtures; add heavy cream and reduce heat to low. Let mixture reduce until almost all of the liquid is gone, about ten minutes. Add TABASCO® Green Sauce and season with salt as needed. Allow the mixture to cook for one more minute, then remove from the pot and refrigerate until cold. In a standing mixer with a paddle attachment, add the masa, baking powder and salt; mix on low speed. Slowly add canola oil. Once oil is well incorporated, increase speed to medium for one minute to mix all ingredients. Masa should be moist, soft and scoopable. If needed, a small amount of water can be added. Remove the rehydrated corn husks from water and rinse them well. Lay the husks out on a table or large work surface that has been lined with plastic wrap. Scoop about a 1/2 cup worth of masa into each husk and spread smooth, leaving a 1-inch gap between the masa and the end of the husk. Sprinkle 3 tablespoons of Monterey Jack cheese over the masa and add 3 tablespoons of tamale filling into the center of the tamale. The filling should be placed in a straight vertical line of even thickness. 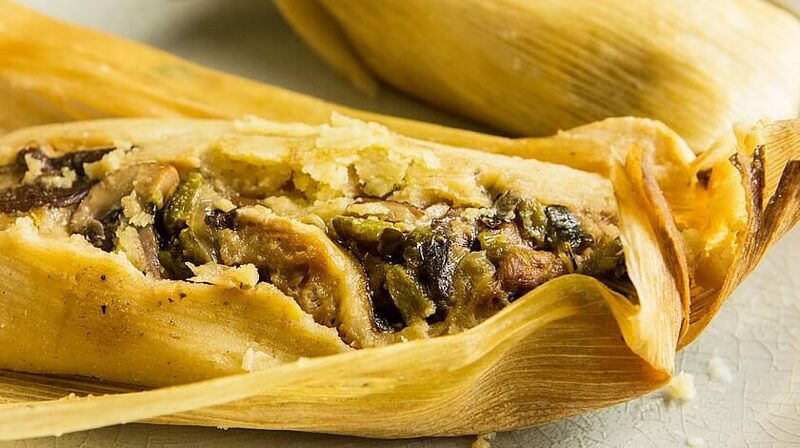 To roll the tamale, fold the filled husk over itself vertically so that the long ends line up, making sure the filling is completely covered by the masa. Fold the overlapping husk from the sides back over the filled center then fold down the top piece of the unfilled husk. Lay the tamales on top of these folds to make sure they stay closed. Set up a large pot with a steamer insert or a pasta pot with a built in strainer on the stove. Line the steamer with the tamales standing up but still resting on one another. Cover the tamales with a wet towel then place lid on top of pot. Steam over medium heat for one hour or until the masa sets up. After one hour, check the masa to make sure it’s firm and able to easily peel away from the husk. If not, add more water to the pot and continue to cook, checking every 15 minutes until done. When masa is set up, remove the steam insert leaving the tamales in the insert until they have come to room temperature.